Canadian wage earners take home less of the country’s total income than American wage earners do, according to new data from the International Labour Organization. There are many ways to measure economic inequality, and one of them is “labour’s share of income” — the percentage of a country’s total income taken home by wage earners. The rest goes to “capital” — business owners and shareholders. The greater the share of income taken home by labour, the more egalitarian the economy, the thinking goes. Our modern economy is anything but egalitarian, and labour’s share of income has been shrinking for decades as business profits soar while wages stagnate. 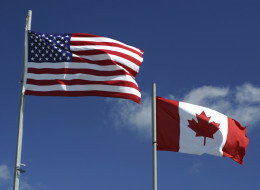 On this measure, Canada is actually more unequal than the U.S. According to the ILO's global wage report, released last week, Americans — by a small margin — take home more of the country’s national income than Canadians do. Labour’s share of income in the U.S. was 56.4 per cent in 2013, compared to 56 per cent for Canada. A small difference, but unexpected, given that most other measures (such as income distribution) show Canada is considerably more equal than the U.S. when it comes to wealth. In fact Canadian labour's share of income is among the lowest of the developed G20 countries, with only Italian and Australian workers taking home a smaller share of the income pie. Most developed countries have been seeing that number slide for years. The ILO’s chart going back to 1991 shows all of the developed G20 economies seeing labour’s share of the income pie shrinking over the years. Interestingly, Canadians’ share has been lower than Americans’ share for much of that period, and the gap today is narrower than it has been typically for years. The report suggests that booming profits in the oil patch have something to do with this. Oil prices have risen from around $20 a barrel around the turn of the century, to above $100 a barrel in recent years before this fall’s oil price rout. “In Canada (and also in Australia), part of the decline is tied to the rise in commodity prices; profits in the mining, oil and gas sectors in Canada doubled between 2000 and 2006,” the ILO report says. But oil and gas wages didn’t rise at nearly the same rate, suggesting wage earners are taking home a smaller share of the oil and gas windfall than they used to. The ILO’s labor productivity index for developed economies grew 17 per cent between 1999 and 2013, but the wage index grew 6.3 per cent, suggesting productivity gains are outstripping wage gains by nearly three to one. The conventional wisdom these days, echoed in the ILO report, is that it’s happening because of automation and globalization. When a company replaces a worker with software, or replaces an expensive worker with a cheaper one in the developing world, it pockets the difference and makes more money, while the salaries it pays out shrink. The ILO adds two other factors: Pressure from shareholders to maximize corporate profits, and the decline of labour union influence, which some economists argue has depressed wages in developed countries. We live in a consumer economy, and for a consumer economy to function properly, consumers need money they can spend. If consumers’ wages are growing disproportionately slowly compared to corporate profits, this will eventually catch up with businesses and affect their bottom lines as well. Take a look, for example, at Walmart, the bellwether of North America’s working class.The company has been struggling even as the U.S. economy has seen a broad recovery. Employment in the U.S. jumped by 321,000 jobs last month alone, according to the Bureau of Labor Statistics, but wages are stagnating. Simply put, Walmart shoppers aren’t sharing in enough of the economy’s wealth to keep the company growing. As some commentators have suggested, the solution to Walmart’s problem could simply be for the company (and other companies like it) to pay their workers more. But companies don’t raise wages so that workers have a “fair” share; companies raise wages when their demand for labour outstrips the supply. With automation reducing the need for people and the developing world essentially adding an enormous new supply of labour to the global economy, it could be a long time before that happens.